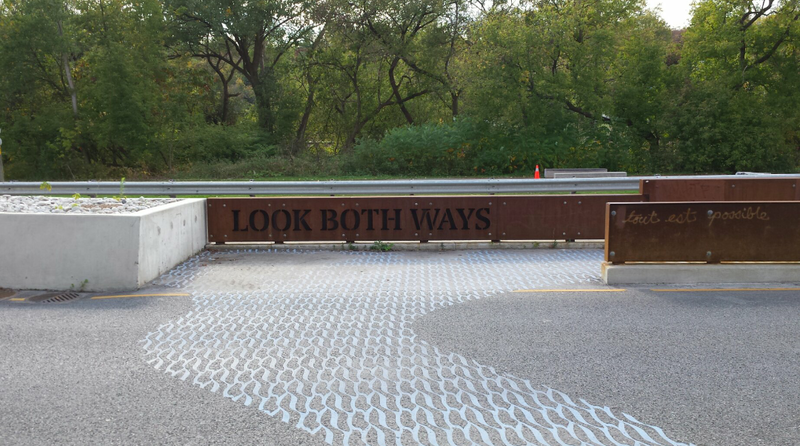 Wayfinding structures guide cyclists and pedestrians in the Lower Don Valley. Toronto’s urban ravine system is a tremendous natural asset. It can be cited as one of a few unique features that distinguish us from other world class cities. The arrival of the Pan Am and Parapan Am Games (July 10-26 and August 7-15, 2015) will bring approximately 10,000 athletes, over 20,000 volunteers and about 250,00 total visitors to the GTA. With the spotlight on Toronto comes a welcome opportunity to realize the inherent potential of our greenways beyond the current patchwork of often disjointed paths and recreational trails. The Pan Am Path project "takes advantage of international attention on Toronto during the Games, showcasing the natural beauty of the city’s parks, rivers and urban ravine systems (one of the largest in the world). The activations along the Path will provide a fun, unique and healthy way for visitors to explore Toronto’s diverse neighbourhoods" says James Gen Meers, Executive Director for Friends of the Pan Am Path. In recognizing the opportunity, this organization was formed to create a vision and implementation plan for maximizing the value of an active transport network drawing on decades of investment. They are a not-for-profit organization taking initiative on fundraising and curating for the various community art installations and cultural activities that function as a relay-style promotions campaign leading up to the opening. 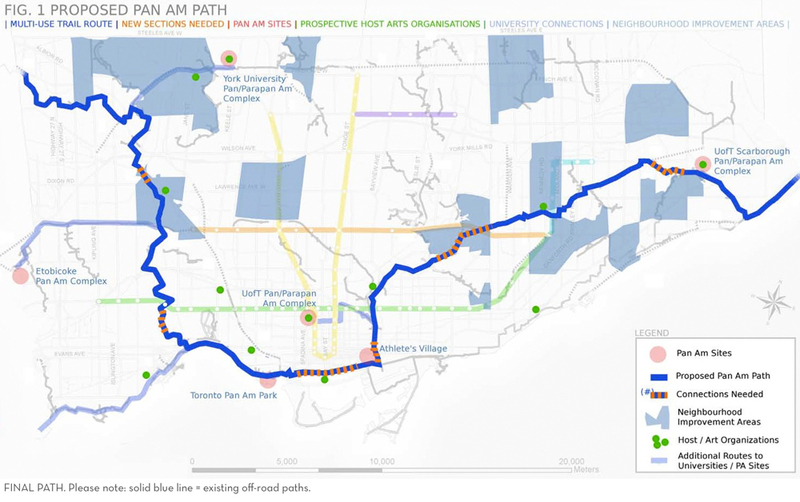 The above map shows the proposed Pan Am Path and the connections needed to create a continuous route between neighbourhoods and venues. Disclaimer: proposed route connections, improvements and other construction as indicated on this map are accurate as of the date listed and subject to change without notice. The nitty-gritty of the plan involves the connection of 84 kilometres of pathways and trails spanning four ravines and two rivers. It begins at the Claireville Reservoir at the northwest edge of the city, winding down the Humber River to the waterfront. The path then proceeds along the Martin Goodman Trail to the Lower Don River, heading north and then east to the Gatineau Hydro Corridor, continuing northeast to Highland Creek, and eventually ending back at Lake Ontario near Rouge Park in southeast Scarborough. The entire network aims to connect five Pan Am sites including the Athlete’s Village, Pan Am Park and the University of Toronto Scarborough Pan/Parapan Am Complex. The connection to York University (faded blue line in the map's top left) is not included in the project scope at this time. The continuous path will be only about 5-10% new construction, which intends to join existing segments and create new possibilities for active transport and recreation across the city. This will focus on several key junctures: The connection of two portions of the Humber Trail and its extension to Claireville and northwest into Brampton; the Central Waterfront Connection to provide continuity along Queens Quay from about Bathurst to Parliament Streets; structural and surface improvements to the Lower Don Trail, and link to the Gatineau Hydro Corridor moving northeast; and two connections continuing northeast on the Gatineau Trail, transitioning to Highland Creek. Finally, the Eglinton West Trail requires a new connection from Mimico Creek to Etobicoke Creek to reach the Centennial Park Pan Am site. Much of the work will occur between now and the summer of 2015; however, this is at heart a legacy project for Toronto and the entirety of the path will not be complete for the start of the games. Signage on an existing section demarcates the shared path for cyclists and pedestrians. While the project’s aspirations cannot be entirely quantified, the chief functional goals are two-fold: To enhance the transportation and recreational components of the existing network; and to create a continuous route linking multiple Pan Am venues. Since much of the route is comprised of already existing paths, resources are devoted to establishing and improving the aforementioned linkages and adding effective signage throughout. The path will travel through seven of the city’s 13 Neighbourhood Improvement Areas, and incorporates the efforts of 12 community/arts host organizations. This highlights a key aspect of the project that seeks to activate cultural equity, mobilize communities and foster inclusion. In speaking with Pan Am Path's James Gen Meers and Lead Curator Devon Ostrom during a riding tour along the route, some of the less overt inspiration behind the plan became clear. The idea is not only to improve physical connections for active transportation (an important priority in itself), but to also build capacity in terms of social and cultural capital. As James states, "The project pulls together three of the region’s strongest assets – parks, diversity and arts...It links neighbourhoods across the city and engages diverse communities through opportunities for art, enriched public spaces, nature, tourism and local economic development.” Toronto's variety of neighbourhoods and culture represent a resource that is helping to engender a sense of ownership over distinct public and outdoor recreation spaces through the partnerships with local community and arts organizations. "Don was here" markings on the path indicate the former course of the Don River, prior to being re-routed. The Pan Am Path seems poised to continue the success of innovative and multi-dimensional city-building projects such as Sherbourne Common, Corktown Common and Tommy Thompson Park on the Leslie Street Spit. These spaces invoke a hybrid approach of place-making and functionality that embraces principles of economic, social and environmental resilience. They often take on a layered form that can offer multiple purposes and user experiences. In the case of the Pan Am Path, this could mean transport routes for cyclists, recreational hiking or micro-tourism opportunities. James also notes that “as cycling-based tourism becomes increasingly popular, the Pan Am ​Path will join a growing family of urban trails (e.g. the Atlanta Beltline, Boston’s Minuteman Bikeway, Chicago’s Lakefront Trail, NYC’s Manhattan Waterfront Greenway, etc.). Path programming will enhance and draw attention to Toronto’s appeal as a destination for cycling enthusiasts, nature lovers and families from across North America and around the world.” At the same time, there is an appeal to legibility of Toronto’s environmental and cultural heritage with respect to the ravine system. 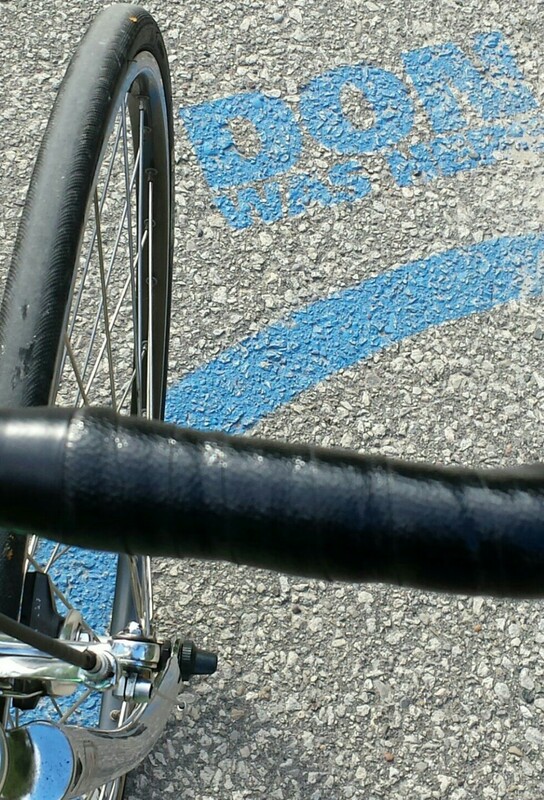 “I’m an ardent supporter of the Pan Am Path. 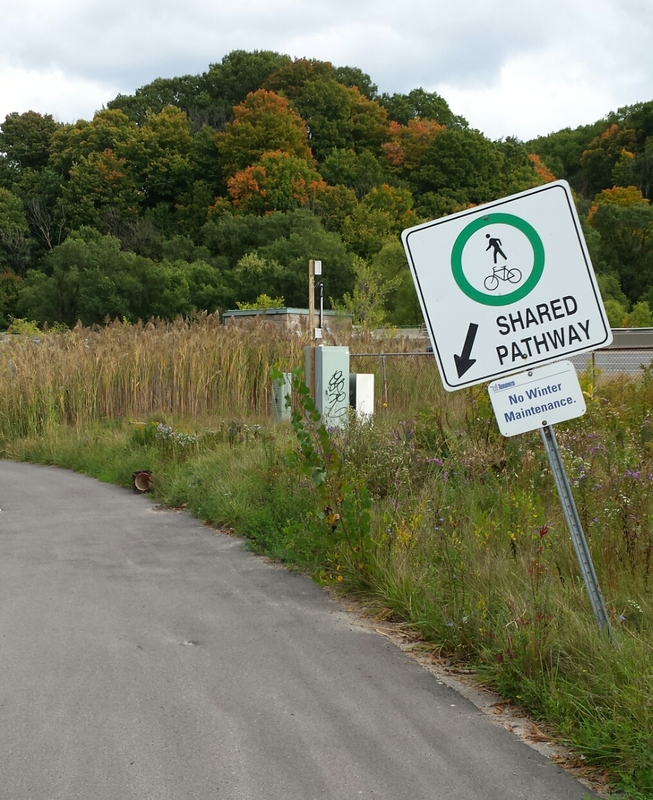 It’s an exciting and bold project to establish Toronto’s longest active living trail system. The Pan Am Path has the potential to transform Toronto into an urban leader in walk-ability and active transportation, strengthening our reputation as a great liveable city. Open Streets programs like the Pan Am Path encourage us to re-imagine how we interact with our city, help find new ways to promote healthy lifestyles and lay the foundation for a more inclusive and economically vibrant Toronto”. The above endorsement speaks to the importance of such projects to our collective future. This plan has a chance to make a strategic investment in active transportation and our natural infrastructure, while engaging communities to help shape the process and generate long-term equity. The opportunity presented itself through a sporting event on a large public stage, but perhaps the full impact will be measured by the success of a broader legacy for Toronto as a result. 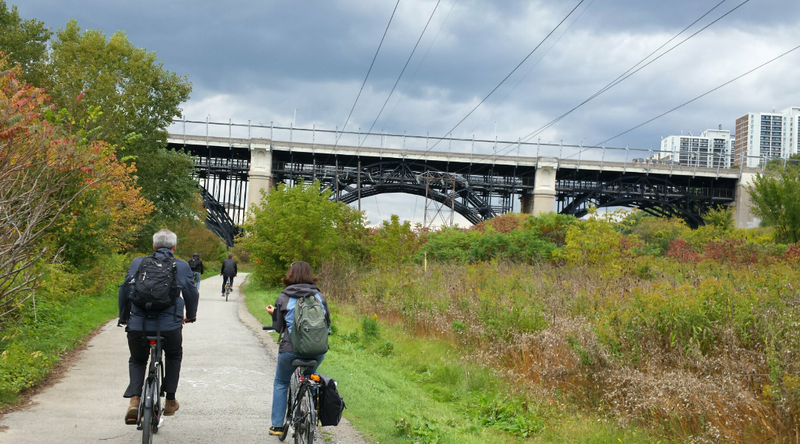 Cyclists cruise towards the Prince Edward Viaduct on the Don Valley Trail. The Pan Am Path is part of the City of Toronto's Host City Showcase Program, a council-approved program to enhance the experience of the 2015 Pan Am/Parapan Am Games for residents and visitors, while advancing the City's economic development and tourism, sport development and healthy living, and resident engagement and cultural celebration goals. The Host City Showcase Program includes dozens of innovative projects with long-term community benefits such as new and expanded community activities and cultural celebrations, new sport and recreation programs, and economic development and tourism initiatives. To learn more about the Host City Showcase Program please visit www.toronto.ca/panam2015. For more information on the on the Pan Am Path or to lend your support to the project, please visit panampath.org.